Two FACTS about concrete or masonry basements that you should know. 1. All concrete/masonry block wall allow water or water vapor to migrate through it- they are water permiable. 2. Water can not be stopped, it must be managed! Grasping these two facts about water will help you keep a drier basement. When surface rain water enters the exterior walls at the ground level, and pushes against the wall is called hydrostatic pressure. Water pressure if not managed correctly will push through the cracks, voids and joints and can with enough pressure, push a wall in. 1. Require your builder to provide a true waterproofing system and provide a manufacture warranty for the waterproofing system being offered. 2. Be aware not all local building codes require waterproofing on basement walls, so if in doubt enquire with your builder. Don't settle for damp-roofing coating, require at least a waterproofing membrane. 3. Spend the extra money to put a protection-drainage board on the wall from footer to grade. A drain/protection board will improve the performance of the waterproofing membrane many time over and offer a longer warranty and peace of mind. 4. Most codes require a footer tile(4"black pvc) both inside the footer and outside the footer and have a minimum of 12"inch of gravel on top of the pipe. This footer drain is essential in removal of excess water. 5. if your yard has a nice fall to it, we recommend if possible to run the footer drains into the yard rather than to a sump pump. One has gravity working for you, the other requires a pump and electricity. TruDry™ Waterproofing membrane is one of the strongest membranes in the market and comes with a 10 year warranty. Green Jacket protection -drainage board is an outstanding product when combined with TruDry or TruDryXG. See resource libarary. Click here to see all of our waterproofing solutions. What is the real value for the adding extra cost of insulation, drainage, and protection on the outside of the basement walls? Fixing a leaking basement after the basement is finished is very disruptive on the family and costly. Why might that happen? Builders generally put the same dirt back into the hole that they dug out because it would be cost prohibitive, so whatever came out including rocks, sticks, and construction debris goes back in. The only thing stopping water from entering the foundation wall is a stretchy membrane 40 millimeters thick membrane that is easily damages by rocks and construction debris. To prevent damage to the waterproofing membrane we recommend a protection product that like Green Jacket or Dow Perimate, they also add insulation and drainage of water to the footer drains. 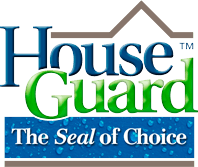 HouseGuard offers at 20 year dry basement warranty. How ensure water is running away from the foundation wall? See this video below. Seal Cracks above grade: A grey waterproofing paint can be purchased and applied to help eliminate leaking through the top portion of the basement wall area. Also pick up a silicone caulk for those cracks showing above the ground, apply that caulk to ‘all’ cracks, even those that appear fine. Changiing the grade and sealing cracks are things you can do for a low cost with a little labor and greatly reduce chance of water entering your home when those big rains come. Yes, inspect your gutters, make sure they are clean, full of debris gutters will cause water to spill over the top of the gutters. Go out when it is raining look at the valleys, is water running over the sides, if so raise the corner splash guard to keep the water from splashing over. Down Spouts: Make sure all of the down spouts are hooked up and running away from the house. Most of us have these two foot plastic or concrete splash blocks below the down spout or water faucet, but this is not going to prevent the water from running away from the home unless you have a strong slope at the end of it. We recommend running a solid gutter product out away from the home 10 feet. Use your good judgment!